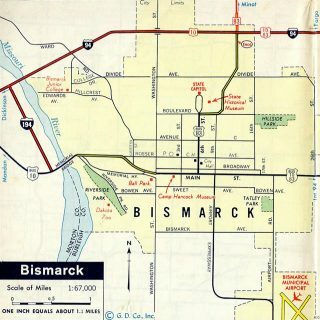 I-194 on the Bismarck-Mandan inset of the 2007 North Dakota Official Highway Map. 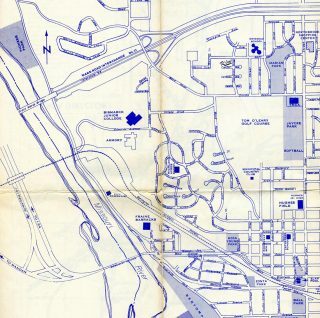 Although never signed in the field, I-194 appeared as a full Interstate on the 1982 North Dakota Official Highway Map. It was omitted by the 2002 edition, but reappeared by 2007 as a business route. The 2015-16 map again shows I-194 with a tricolor shield, but with non-Interstate line work. Interstate 194 represents the northern half of a 3.5 mile freeway linking I-94 with the capital city of Bismarck at Washington Street via east Mandan. The Interstate portion of the route ends 1.072 miles south of Interstate 94 at the interchange with Business Loop I-94 (Memorial Highway). The remainder of the freeway southeast across the Missouri River is a part of unsigned North Dakota 810. Bismarck Expressway transitions to an arterial route at Washington Street. The expressway loops across the south side of Bismarck, serving a retail corridor anchored by Kirkwood Mall and an industrial area north of Bismarck Airport (BIS). The ND 810 portion of the route concludes 5.741 miles east of I-194 at 5th Avenue NE. Business Loop I-94 turns north onto the expressway from there on the final 1.658 mile return to Interstate 94 at the Centennial Park area. All mileage figures cited here were obtained from the 2016 Route and Mileage Map prepared by NDDOT. Interstate 194 was constructed at the same time Interstate 94 was built from Mandan eastward through Bismarck. 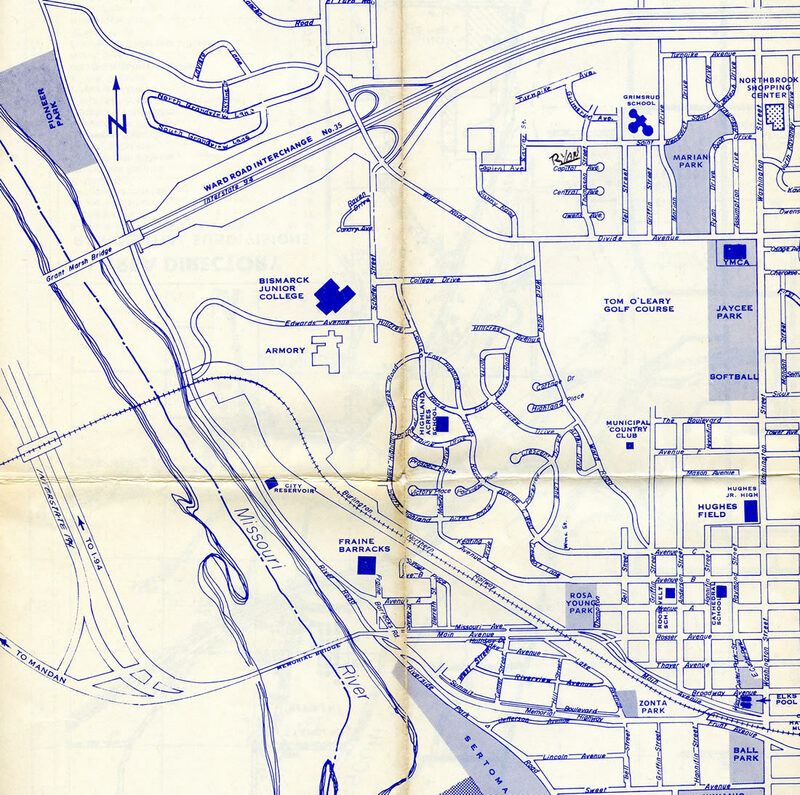 This included the Grant Marsh Bridge spanning the Missouri River, which was dedicated on December 9, 1965.1 I-194 consisted of just the spur southeast to Memorial Highway and Main Avenue, the former alignment of U.S. 10 between the sister cities. Source: 2016 Traffic Volume Map – North Dakota Department of Transportation. 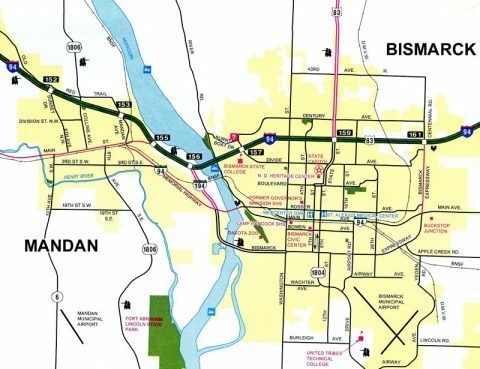 Prior to the construction of Bismarck Expressway, I-194 simply linked Interstate 94 with U.S. 10 Business east from Mandan to the Memorial Bridge spanning the Missouri River. 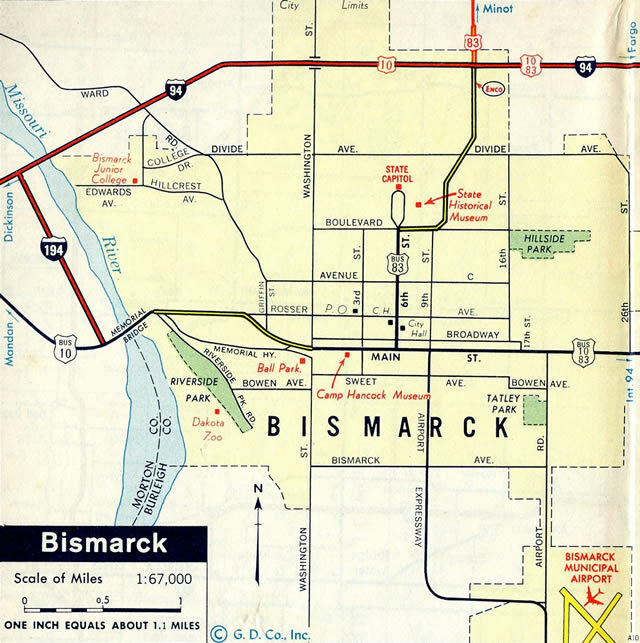 1976 Chamber of Commerce map of Bismarck showing the at-grade connection between I-194 and Business Loop I-94. Leaving the city limits of Mandan, Interstate 194 heads north 0.75 miles to the trumpet interchange with I-94. Sign changes made here by 2011 replaced the local control cities of Bismarck and Mandan with Fargo and Billings. Photo taken by Jeff and David Morrison (05/11/07). 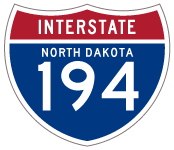 Interstate 194 north defaults onto I-94 west as it bypasses Mandan to the north. Travelers joining I-94 east immediately cross the Grant Marsh Bridge over the Missouri River. These signs were replaced by 2011. Photo taken by Jeff and David Morrison (05/11/07). This ground level sign for Bismarck Expressway was replaced with a Arrow-Per-Lane (APL) overhead by 2011. Exit 156 references the connection with parallel Business Loop I-94 in place of the I-194. 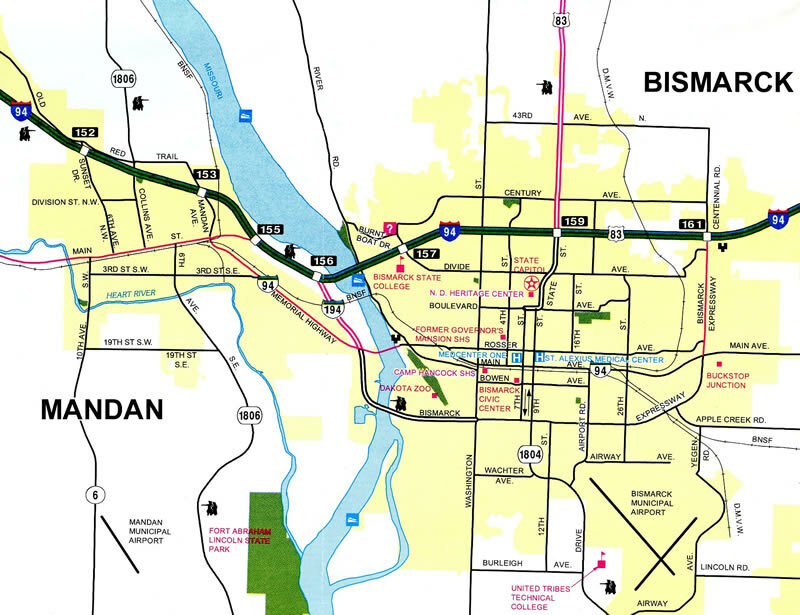 The business route follows old U.S. 10 along Memorial Highway through Mandan and Main Avenue to the Bismarck city center. Photo taken by Jeff and David Morrison (05/11/07). Exit 156 partitions from Interstate 94 east with two lanes for Interstate 194 south to the Bismarck Expressway. This sign bridge was replaced by 2011 with a new APL overhead. Photo taken by Jeff and David Morrison (05/11/07). Exit 156 departs from the left-hand side of Interstate 94 west for unsigned I-194 and Bismarck Expressway southeast to Mandan and Bismarck. Sign changes made here by 2011 added left-exit tabs and Business Loop I-94 and ND 6 for Exit 155. Photo taken by Jeff and David Morrison (05/11/07). Traffic from I-94 east and west combines just ahead of a BNSF Railroad overpass. The lone exit of the unsigned Interstate departs quickly for Business Loop I-94 (old U.S. 10). This sign was replaced by 2011 to display Clearview font. Photo taken by Jeff and David Morrison (05/11/07). An unnumbered off-ramp takes motorists bound for both directions of Business Loop I-94 and 46th Avenue SE south in unison. The business loop follows Memorial Highway west back into Mandan. East of I-194, Business Loop I-94 crosses the November 2008-opened Liberty Memorial Bridge to Main Avenue in Bismarck. The pull through panel was replaced in 2011 and no longer displays the University of Mary. Photo taken by Jeff and David Morrison (05/11/07). Bismarck Expressway transitions from unsigned ND 810 to unsigned I-194 at the six-ramp parclo interchange with Business Loop I-94. Signs simply reference the connection with Interstate 94 in the northbound direction. Photo taken by Jeff and David Morrison (05/11/07). #tbt to the Grant Marsh Bridge dedication in Bismarck on December 9, 1965. Pictured is Highway Commissioner Walt Hjelle (left) and Chief Engineer Robert Bradley (right). A presentation about this project called “Building the Interstate in North Dakota- Crossing the Missouri” will be presented on Jan. 10, 2016 at the Heritage Center in Bismarck. #throwbackthursday #nddot [Facebook update]. Retrieved from https://www.facebook.com/nddot/photos/a.88387089460.81002.88374649460/10153778491739461/?type=3. A lot has changed since this #throwback picture was taken in the early 80s! This is Bismarck Expressway looking west near the 9th Street intersection. #tbt #throwbackthursday #nddot [Facebook update]. Retrieved from https://www.facebook.com/nddot/photos/a.88387089460.81002.88374649460/10153873066009461/?type=3. “Bridge’s chances look iffy – Sioux, Emmons counties still want to be connected.” Bismarck Tribune, The (ND), November 24, 1995.